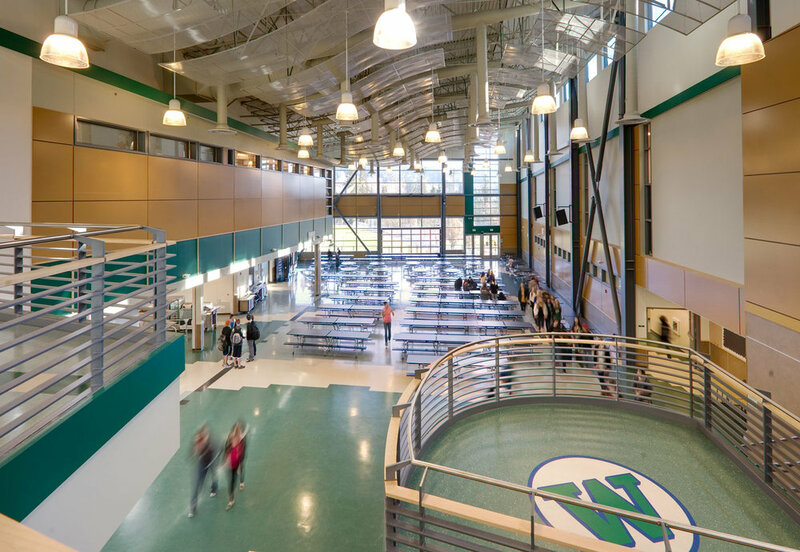 Named a Silver Medal School of Distinction in U.S. News and World Report magazine’s Best High Schools 2009, Woodinville High stands as one of Washington State’s premier public education facilities. Studio Meng Strazzara’s design of the multi-phased project reconnects the campus and combines all academics in a single facility unified by its large central commons. Initial work began in 2006 with a program feasibility and building conditions assessment to determine whether the current site would work for the new or modernized facility. 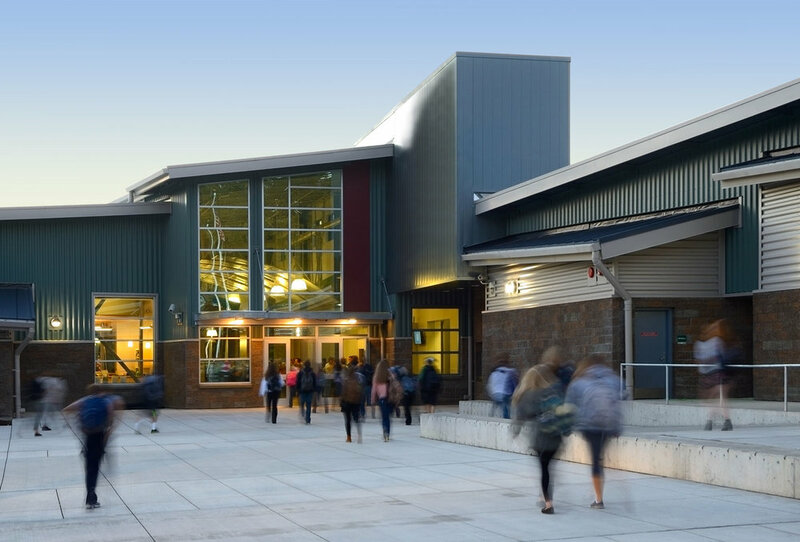 Northshore School District and the design team explored various options before choosing to pursue the design and construction of a brand new building with modernization of several of the existing buildings. 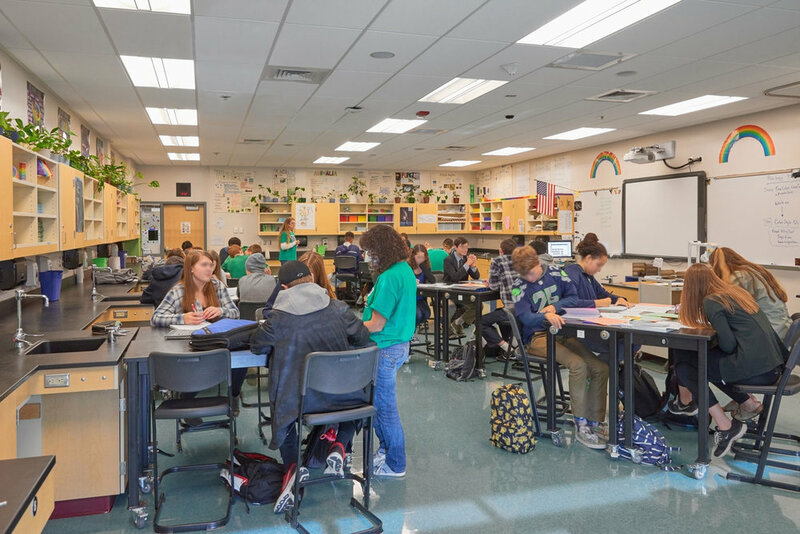 This led to a detailed Master Plan with phasing schedule that spans three bond cycles. Completed in Fall 2009, Phase I of the project comprises the school’s new commons, cafeteria, full service kitchen, library and a media center. The new commons serves as the “heart” of the building that serves all students, and from which future building “grew out” from. Supporting many activities beyond simply cafeteria space, the commons is utilized for a variety of events and activities, including dances, presentations, concerts (by the school’s music dept. ), club meetings and as alternate curricular space. A wide, roll-up exterior door connects the commons to an exterior patio, providing additional space and flexibility for activities to take place within the commons. The new library “pops out” over the commons, connecting both spaces. 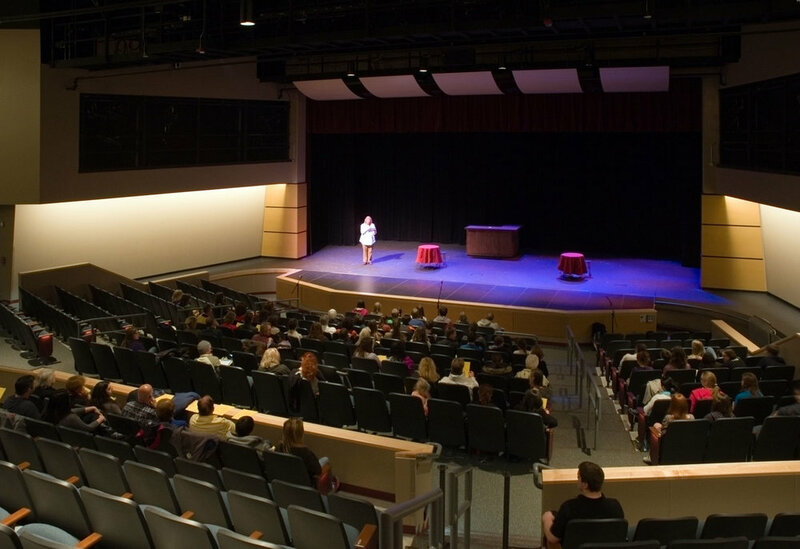 Phase II includes a new 3-floor 70,000 SF academic wing (completed in 2011), a new performing arts center for drama and music (450-seats), and a new administration, counseling and career center completed in 2012. Site improvements include new visitor and bus drop-off pick-up areas/loops, new student plazas and courtyards as an extension to the commons, pedestrian walks and amenities, new reconfigured parking facilities and improvements to the existing playfields. Work on Phase III began in 2014, and includes modernizations to the gym, arts, science & technology building and classrooms. The Arts & Technology Building received all new interior finishes, lighting, casework, fixtures and specialty equipment as needed to support the academic programs. A new entry area features display space to highlight department projects and achievements. A new photographic chemical (wet) lab and video and lighting lab have been added. The technology curriculum are located in a new computer lab supported with space to house 3-D printers and computer guided milling machines.